THE Derry village of Kilrea came to a standstill on 11 July as hundreds of local people and Sinn Féin party activists attended the funeral of local republican activist Christopher O’Neill (22) in St Mary’s Church. Christopher and his close friend Declan McKenna died in a tragic road accident on 6 July just outside the village. 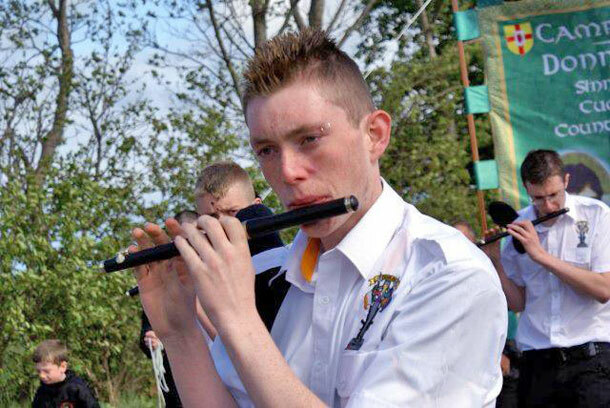 Christopher, a mechanic by trade, had joined Sinn Féin aged 16 and was also a member of the Dunloy Fallen Comrades Republican Flute Band. At the time of his death he was chairperson of the McGinn/Rodden/Donaghy/Cassidy Sinn Féin Cumann in Kilrea. He had previously stood for the party in the 2011 local elections for Coleraine Borough Council, coming very close to taking a seat. Christopher was the grandson of Sinn Féin Councillor John Davey, who was shot dead by the UVF colluding with British state forces in February 1989. One of Christopher’s friends and comrades, Seán Bateson of Sinn Féin Republican Youth, described ‘Chrissy’ as “an exceptionally kind, generous, down-to-earth and warm-hearted lad who had all the time of the day to sit and chat away to everyone regardless of who they were.” He said it was these qualities which had made him such a capable and talented young activist. Also speaking at Christopher’s funeral, Sinn Féin President Gerry Adams TD said he was very sad but very honoured to be asked to say a few words. He described Christopher as a republican through conviction. “While he was conscious of his grandfather’s enormous contribution to Irish republicanism and of the circumstances of his death, Christopher’s republicanism also came from his own deep understanding of the damaging effects of partition and British Government involvement on this island. “Christopher understood that the republican struggle for freedom and justice and the reunification of Ireland is the best means to secure a lasting peace between the people who live on this island and between these islands. “I am very certain that John Davey, who helped lay the foundations of a strong republican party in this area, would be enormously proud of Christopher. He would be equally proud of the achievements of local republican activists.